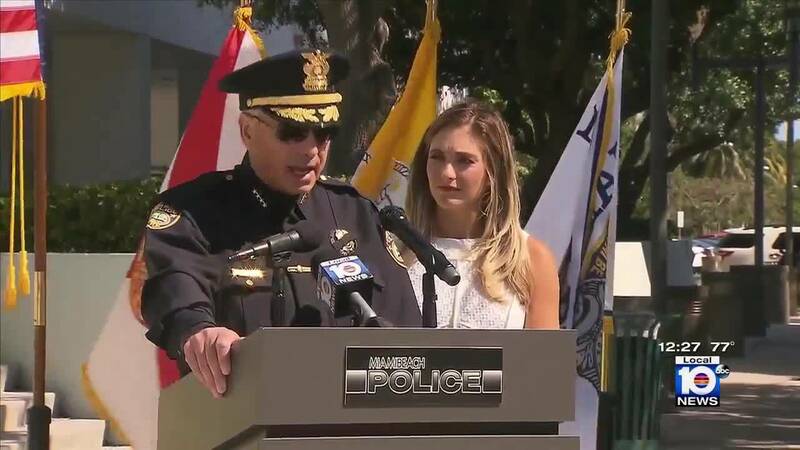 MIAMI BEACH, Fla. - A Local 10 News reporter received a special honor on behalf of her late father Thursday during a Miami Beach police ceremony honoring officers killed in the line of duty. Local 10 News reporter Erica Rakow attended a memorial for fallen officers at the Miami Beach Police Department, where she was asked to speak. "The chief of police, the commands staff, the awards board and the memorial committee unanimously agreed this year to make Detective Scott Rakow a recipient of the department's Medal of Honor," Chief Dan Oates said. Scott Rakow was fatally shot on June 30, 1988, when his daughter, Erica Rakow, was just a little girl. Chief Dan Oates announces that Local 10 News reporter Erica Rakow's father is being presented with the Medal of Honor. Erica Rakow said she was "very surprised" by the honor. She and her mother accepted the Medal of Honor on her father's behalf. "I was not expecting that at all," Erica Rakow said. She said the chief asked her to return to the stage before he made the announcement. "Am I in trouble?" she told Local 10 News reporter Eric Yutzy what she was thinking. The Medal of Honor is presented to the man whose name is the last of seven on the Miami Beach Police Department's memorial wall. 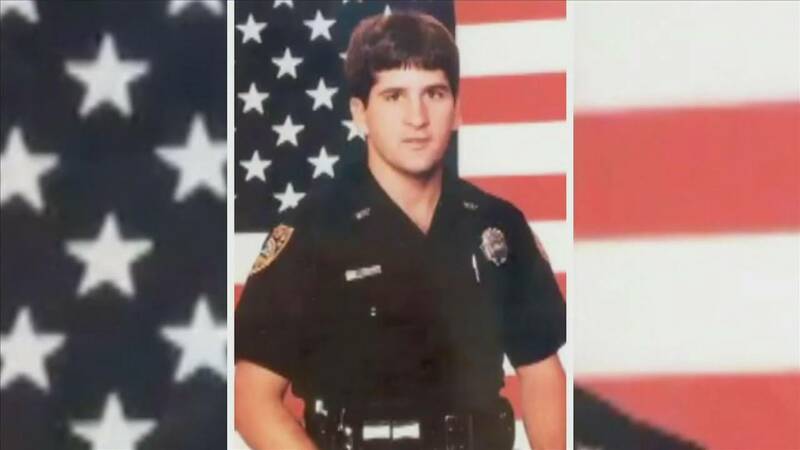 Miami Beach police Officer Scott Rakow was killed in the line of duty in 1988. "He made it his personal mission to make Miami Beach the safest place in the world for people to live, to work, to play and visit," Erica Rakow said. "He did that with his gun and a badge. I believe I am doing what I can now with a microphone." "I do believe that her dad had something to do with her return back to Miami Beach, and (Local) 10 was the channel we watch," Toni Rakow said. "I mean, Ann Bishop memorialized my husband on (Local) 10 News way back in the day." 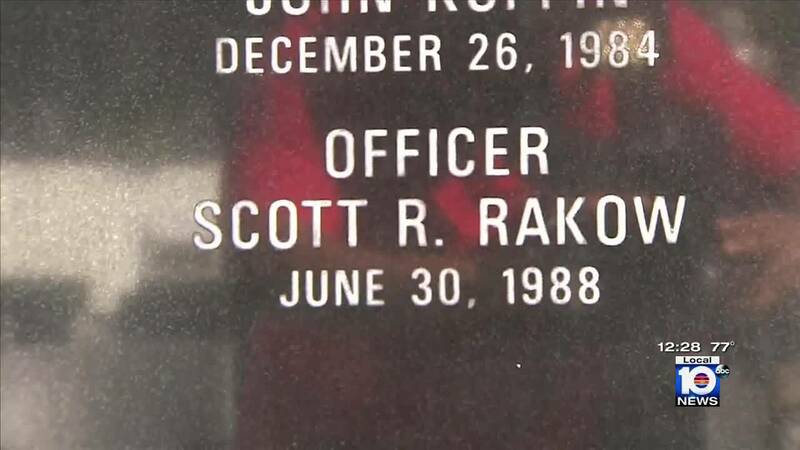 Officer Scott Rakow's name is the last of seven on the Miami Beach Police Department's memorial wall. A rose was placed on top of the memorial in Scott Rakow's memory -- a memory that lives on through his daughter. "It means so much to me," Erica Rakow said. "I mean, there's a lot of these officers -- the chief, who didn't even know my dad -- and they treat him as if he was one of their best friends, and that is truly special."